A former Lansford coal miner has been memorialized by a central Pennsylvania rock band that chose his picture for their latest album. Portrayed in his work clothes after a shift in the mines is the late Edward J. Rehatchek Sr., holding a shot glass of liquor and mug of beer for a chaser, a common antidote among miners for a dry mouth and dusty throat. (Rehatchek), a native of Coaldale, was a contract miner in the No.14 colliery for Lehigh Coal & Navigation; but as the mines closed or slowed production, he got a job at Mack Trucks Inc. in Allentown. "I'm very proud," said his widow, Eleanor, who lives at 9 E. Oak St. in the borough where she and her husband lived and raised their large family. "We had 10 children, and nine are living," said Eleanor Rehatchek, 62, who has been slowed the past few years with various ailments. Her husband died in 1985 at 56. "They said it was a heart attack, but I still can't believe it. He was never even sick," she said, as one of her children, Donna, nodded in agreement. They sat in the living room, and the mother recalled the days when she and her husband and children were a close family. Her sons and daughters have scattered, she said, but none is more than an hour or two by car from the family homestead. Recalling her husband, she showed a book of photos they published together, highlighting the inner workings of anthracite mines. There are pictures of hard-working miners who labored to produce countless tons of the black diamonds for use as a heating fuel. "We got many of the pictures from the company office (of Lehigh Coal & Navigation Co.)," she said, "and others were donated by friends and neighbors." She said she would like to have an updated publication printed but her failing health has kept her from working on it. Her husband, a native of Coaldale, was a contract miner in the No.14 colliery for Lehigh Coal & Navigation; but as the mines closed or slowed production, he got a job at Mack Trucks Inc. in Allentown. Later he opened his own auto body and paint shop, she said. When she was asked by the Badlees band for permission to use her husband's photo for their album "Diamonds in the Coal," she agreed, mostly to keep alive her husband's memory and the part he and others played in creating the heritage of the hard-coal regions. If she had her choice, however, she would have preferred an album of polka music or country-western, she said. 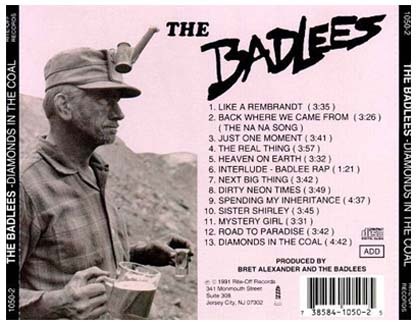 The Badlees saw Rehatchek's picture in the Tamaqua Historical Society's museum and felt he depicted a typical coal miner and was ideal for their latest album. Members of the group, all from Northumberland, are Pete Palladino, Ron Simasek, Bret Alexander, Jeff Feltenberger and Paul Smith. A slogan on a T-shirt promoting their musical release says, "There are few things easier than to live badly and die well!" Another motto of the group is, "How bad can it be!" The 13-cut cassette tapes and compact discs are available in area record shops, said Eleanor Rehatchek. The group's music has been described as the type that might have been created if singers Bruce Springsteen, John Mellencamp and Tom Petty would have grown up in Pennsylvania and formed a band together. 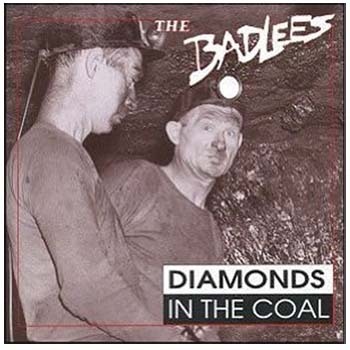 "Diamonds in The Coal" was released Jan. 14 by Rite-Off Records, Jersey City, N.J., said Terry Selders, owner of the company and agent for The Badlees.